Did you, like me, have grand plans for the week between Christmas and New Year's? I was going to spend lots of time cuddled up with a blanket and a cup of coffee, writing and coming up with some amazing content to share with you all. 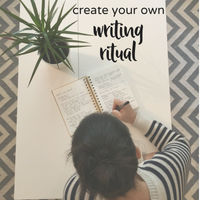 Make a marketing plan for my upcoming writing course and lay out the agenda for a workshop I'm hosting this month. I didn't know what day it was let alone have space for creativity. What I did have was lots of time with my family. Let me tell you about one of those days. We gifted tickets to our family for the SpongeBob musical on Broadway in New York a couple days before New Year's. I had found the tickets at a really affordable price and I was so excited to be in NYC to see this show in which many inspiring musicians collaborated, like Sara Bareilles and John Legend. We finally got to the theatre, all seven of us, after driving, parking, cabbing, walking, stairs. The seats were in the very.last.row of the theatre. So high up that you literally had to lean forward to see the front of the stage, but everyone else in the balcony below you is doing the same so it really doesn't help. We get everyone in the seats for two minutes and realize they have boosters for the kids, so off my husband goes in search of them. My 8 year old daughter, Carly, starts moving from seat to seat, shuffling all of us in our tiny space. I realize Curt's been gone for 15 minutes and he texts saying they won't let him back up yet. My mother-in-law starts feeling ill and heads for the bathroom located directly behind our seats. Carly's getting really antsy and decides she needs to climb the five flights of theatre stairs, so she sprints away with my brother-in-law. My sister-in-law leaves the theatre to search for medication for her mom. It was quite a scene. Only me and my 6 year old son, Griffin, saw the majority of the show. A part of me was really disappointed. Our whole trip centered around this event and here we were with everyone miserable and scattered. But a little part of me said, "Enjoy the show. You have family here to help you." And I (mostly) did. I loved the show. Griffin even sat on my lap for 20 minutes, which I relished knowing those days are coming to an end. The fact that we had really crappy seats? It turned out to be the perfect spot for my antsy, stomachache-y family. I can't imagine being front and center while all of this played out - that would've been completely distracting for those around us. But in the way back, my family could do what they needed to without bothering anybody. When was the last time this happened to you? We build things up in our heads and our expectations soar. Then the trip or concert or party happens and fails to live up to those grand ideas. Science shows it's good for us to plan and to anticipate fun times, so I'm not suggesting you stop doing that. Maybe having more realistic expectations about how things might play out would help. Or maybe asking yourself, "What can I enjoy in this moment?" can be a really useful tool. Because I actually sat in a seat for the entire show as my family offered to help my daughter and mother-in-law. What a blessing and a gift. And what a shame it would have been if I chose not to receive it.